The group from Idaho-based charity New Life Children’s Refuge told the BBC they wanted to take quake orphans to an orphanage in the Dominican Republic. 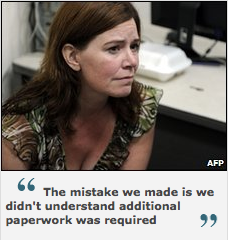 But Haitian police said the Americans had no papers authorising to take children out of the country. They have not yet been charged. The Americans are being held at a police station next to the airport in Haiti’s capital Port-au-Prince. “This is an abduction, not an adoption,” Haitian Social Affairs Minister Yves Christallin was quoted as saying by the AFP news agency. “What is important for us in Haiti is that a child needs to have an authorisation from this ministry to leave the country,” Mr Christallin said. PORT-AU-PRINCE — A Haitian judge questioned a group of Americans accused of trying to smuggle children out of the quake-stricken nation as the chaos forced authorities to call off an election. As parents turned up to claim some of the 33 children the Baptist group had tried to take into neighbouring Dominican Republic, a judge interviewed five women on Tuesday and was to see five men detained in the case on Wednesday. Judge Isai Pierre-Louis said he would decide after the latest questioning at the Port-au-Prince police headquarters whether to charge the Americans from the Idaho-based New Life Children’s Refuge. 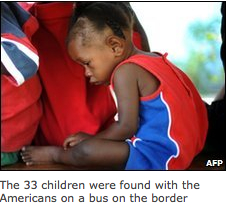 The 10, who were held on Friday as they tried to cross into the Dominican Republic with a busload of 33 children with no passports or permission to leave Haiti, could face charges of criminal conspiracy, kidnapping minors and child-trafficking. 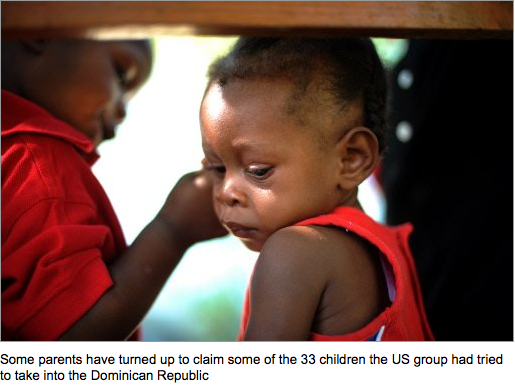 Related article: Mistrust in the eyes of rescued Haitian children. Between 15 and 20 of the children still had at least one parent, Georg Willeit, a spokesman for SOS Children’s Villages, the US group now caring for the children, told AFP. “Some parents are now showing up to be reunited with their children, some of them met yesterday with social workers… but we cannot allow any reunion until we make clear why they were on that bus,” Willeit said. The case has caused a major controversy in Haiti. Gervais Charles, president of the Port-au-Prince Bar, said the nation’s justice system would struggle to cope with a high-profile abduction trial. “We have lost the foundations of our justice system. It is a very difficult moment for us,” Charles said. Laura Silsby, the detained head of New Life Children’s Refuge, insisted however that the group simply wanted to give the children a better life in an orphanage it planned to set up in the Dominican Republic. The quake chaos forced the enfeebled Haitian government to indefinitely call off legislative elections that had been planned for February 28 and March 3. It gave no indication when the vote could be held and as political insecurity grew, the United Nations revealed that armed men had attempted to hijack a food convoy on a road near Jeremie airport at the weekend. Security is one of the main concerns of international relief teams and desperate residents of the capital Port-au-Prince, the scene of widespread looting after the 7.0 magnitude quake that has left an estimated one million homeless. UN officials said nearly half a million people had fled Port-au-Prince for the countryside, doubling a previous estimate of 235,000. OCHA said the prices of basic commodities such as rice and sugar were rising and medical centers were short of supplies and equipment. France’s President Nicolas Sarkozy will be the first international leader to visit Haiti since the quake on February 17, his office announced. The presidency said Sarkozy would inspect reconstruction efforts, which France is taking part in. The World Food Programme said it has been promised more than 230 million dollars for its Haiti emergency operations, but it would now need more than 800 million dollars (570 million euros) to extend an operation to feed desperate Haitians through this year. The largest donors were the United States, Canada and Spain, but WFP said it received important rice donations from Thailand and Malawi, a country previously depending on food assistance. This appears to be one of those unfortunate situations that has been blown out of all proportions. 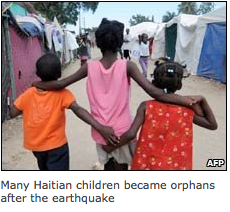 In the chaos following Haiti’s devastating earthquake an orphanage had been flattened. Those in charge put the kids on a bus and planned to relocate them to an orphanage in the Dominican Republic. En route they were stopped by authorities and the rest is history. There has been a lot of talk about child-trafficking in the period after the quake. It has become a focal point for many who cannot understand, or focus upon the overall calamity. It would seem that these people were simply interested in the well-being of the kids. Unfortunately, on most occasions, the Haitian authority – specifically President Preval, has absolutely no focus on anyone’s well-being, other than that of him, his wife, and other close associates. Give these people a quick polygraph and the truth will be there, otherwise, this will drag out towards infinity as the frenzy builds. The Haitian government has accused the American missionaries of kidnapping and is investigating the incident before releasing the children back to their families.